This is what happens when you're on the cutting edge of what's physically possible. Lap times and McLaren go hand in hand like lag on a turbocharger or large egos and prancing horse badges, but Evo’s latest test of the 570S, McLaren’s answer to the Porsche 911, may be one of the most controversial yet. What’s interesting is that the 570S is in McLaren’s Sport Series, the cheapest and slowest segment one can buy under the British automaker’s brand not including its cute children’s toys that it uses to prank us journalists and you readers. However, as we quickly learned after watching the 570S do what McLarens do best, "slow" is a relative term because after all, it’s not every car that can beat a Porsche 911 Turbo in the twisties. Proving that is the fact that the MaCa finishes 1.3 seconds faster than the 911 Turbo and just 0.3 seconds shy of the Ferrari 458 Speciale (certainly enough to crush a standard 458 Italia). Things get a bit weird when delving into the comments section where concepts as solid as gravity are questioned by the masses both eligible or not. 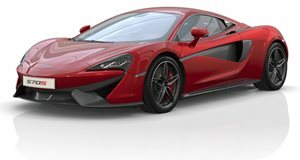 The discussion was spurred by cars higher on the list since the Ferrari 488 GTB shows the same 1:12.8 second lap as the McLaren 675LT, which to some signifies that Ferrari supplies journalists with press cars that are, we’ll just say "altered," from what a customer gets. This is untrue given that independent tests of Ferraris supplied to outlets by customers yield the same results as models procured from the automaker, but the controversy and the leaderboard record lap times all go to show that Porsche, Ferrari, and McLaren build the fastest track cars available making it hard to carve out a difference.